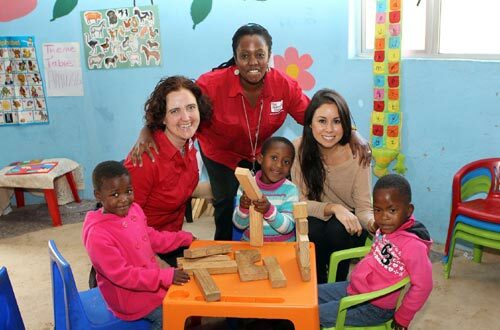 Catherine Deane, the Hong Kong-based designer was recently on a short visit to South Africa in her capacity as ambassador for The Unlimited Child, a non-profit organisation committed to improving early childhood development throughout South Africa. With offices in Hong Kong, London and New York and clients such as Beyonce, Selena Gomez, Fergie and Pippa Middleton, Deane will be using her profile to raise awareness and funds for the cause. Deane's roots sit in Durban as this is where she grew up and was educated. After completing a diploma in fashion design at Durban Technikon, she started her own clothing business and this is where she gained first-hand experience of the impact a lack of fine motor skills can have in later life. "Many of the local seamstresses had trouble with basic tasks such as cutting fabric and even with on-the-job training, there was not much improvement. It made me realise the importance of early childhood development as this is when our fine motor skills and cognitive skills are developed," she says. According to Cassy Healy, CEO of The Unlimited Child, early childhood development issues are not limited to South Africa. "Unless children younger than six are exposed to the correct stimulation such as learning colours and shapes through educational toys, they will never reach their full potential in life. They will be untrainable and destined for a life of poverty as they will never have the ability to learn a skill. The situation is dire as currently there are over six million children in South Africa who have little or no access to early childhood development." The Unlimited Child is addressing early childhood development as it provides educational toys as well as practical training for caregivers for crèches in underpriviledged areas. "By giving caregivers access to these toys and training them how to use them to stimulate the children, we are helping them to prepare these children for school. Through play the children attain valuable language, numeracy and motor skills, while also receiving life skills training in terms of socialisation and sharing. With these vital skills, children enter school with ready minds and the capacity to maximise their potential," Healey says. During her visit to South Africa, Deane visited a number of crèches in the Valley of a Thousand Hills. "The difference between the children in the crèches that have applied The Unlimited Child model is huge and it's incredible to see how the caregivers embrace this opportunity. The whole experience has been unbelievably motivating and has given new meaning to my role as an international ambassador," says Deane. Commencing with her 2012 Autumn Winter collection, Deane will make a donation from the sale of each dress to The Unlimited Child. This donation will provide a child with a year's supply of educational toys. The Unlimited Child has already successfully reached over 260 crèches stimulating more than 20 000 children and has provided training for more than 751 caregivers in KwaZulu-Natal. The organisation recently rolled out pilot programmes in the Western Cape and Gauteng in June 2012. For more, go to www.theunlimitedchild.co.za.